itsik@circlesocal.org 1525 South Robertson Blvd. Los Angeles, CA 90035. 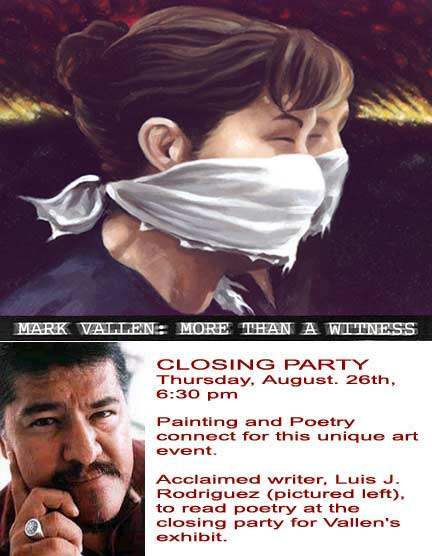 "MARK VALLEN: MORE THAN A WITNESS"
Art Exhibit Closing Party with Poet, Luis J. Rodriguez. Painting and Poetry connect at this unique art event. Acclaimed writer, Luis J. Rodriguez to read poetry at the closing party for artist Mark Vallen's major retrospective exhibition encompassing thirty years of work. Rodriguez the writer and Vallen the painter will collaborate in offering a powerful evening of socially conscious art. Internationally acclaimed writer Luis J. Rodriguez, will present a reading of poetry to salute the conclusion of the exhibition, "Mark Vallen: More Than A Witness". The award-winning Chicano author will read selected works from his impressive repertoire, as well as talk about the importance of culture in building movements for social change. Rodriguez will also recite the verse of famed poet Pablo Neruda to commemorate the 100th anniversary of the great Chilean writer's birth. Luis J. Rodriguez has emerged as one of America's premier Chicano writers. Known for penning the cautionary autobiography and international bestseller, Always Running: La Vida Loca, Gang Days in L.A., Rodriguez has also written seven other books of short fiction, as well as nonfiction, children's literature, and poetry. He has won awards and garnered accolades too numerous to mention, but most importantly believes that a writer can help make a difference. The author's enthusiastic activism and mentoring of youth through poetry and art earned him an Unsung Heroes of Compassion Award presented by the Dalai Lama. Mark Vallen: More than a Witness explores the secret histories of Los Angeles' recent past. Known as the advocate of a new social realism, Vallen's thought-provoking artworks confront the public with a myriad of political and social issues that have impacted the people and city of L.A. With paintings, drawings, and prints, Vallen documented the upheavals and social realities that helped to shape the face of L.A. The topics addressed by the artist range from the Vietnam War to the battlefields of Central America, and the resulting waves of immigration these conflicts engendered. Vallen submerged himself in the city's original 1977 punk rock explosion, and created portraits of the fans and musicians involved. The artist's brush railed against apartheid and the Cold War of the 1980's, and captured the Rodney King riots of 1991. This solo exhibition presents a chronology of studio works, pieces created as public art, illustrations for books and newspapers, and artworks never before shown. Group and guided viewings can be arranged. The artworks will also be on view during regular events at the Workmen's Circle. "Mark Vallen has become an accomplished Social Realist for the early 21st century. He honors his predecessors by focusing on the pressing issues of our own perilous times. Proud to embrace the same label, he does in the late 20th and early 21st centuries what generations of political artists accomplished during their own turbulent time". - Paul Von Blum, author of The Critical Vision: A history of Social and Political Art in the U.S.